"Sometimes keeping things simple is the best way to go - and Esper demonstrates this perfectly. Have you ever felt not quite good enough? At work or at home? Have your accomplishments ever been praised by others, yet have you feeling you could have, should have, done a much better job? That little voice in the back of your head screaming you just don't cut it, and you believing it. The voice may be small, but it's ramblings are shrill and piercing. I know I've felt this way much more than I care to admit. Even during times I should feel accomplished and appreciated. Especially during those times. 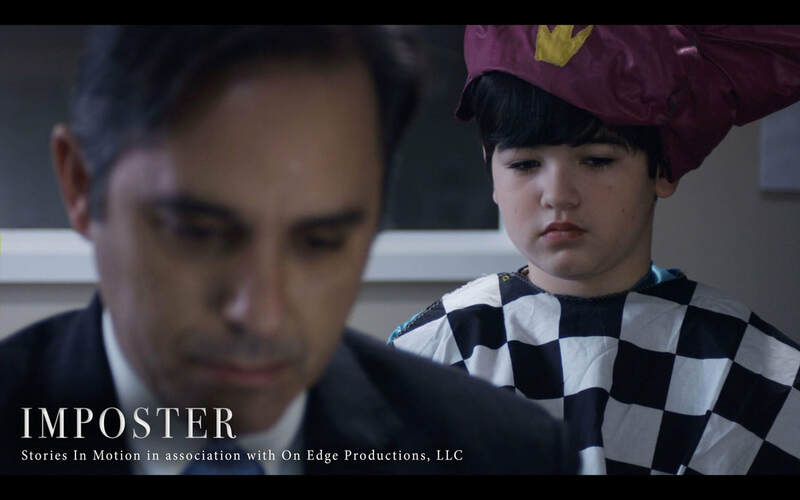 "Imposter" makes a very effective run at using our anxieties and self worth issues as a concept for a short film. A difficult task for anyone, but especially within the micro film world. Chris Esper ventures out with the hopes of easily letting it's viewers know what the film is about. Keeping it interesting and letting loose an excellent metaphor on how to deal with that small(ish) voice. It's very effective yet oddly simplistic for such a complex issue. Keeping with the theme of the title, I went ahead and watched "Imposter" a second time. Much like the plot of Esper's title itself, I wanted to make sure I had everything right in my mind before writing. I knew I did, but kept thinking I had missed something along the way. Sort of like that nagging feeling that you left the stove on when you venture out - even though you know you didn't. I watched as Esper's own circus child (anxiety) messed with him during a work office meeting. I watched as an artist struggled with her inner self during an exhibition - all because a few narrow minded spectators repeatedly dismissed her work. I watched it all, the veteran who gave more than his time to his country, the athlete who should never have been careless enough to hurt himself. An endless stream of people on a bus, their self doubts magically visible to us watching this 10 minute title. Then something scary happened involving a gun, but the scary nature of the event only lasted a few seconds until I realized just what was happening. Esper's "Imposter" uses this scary event as a solution. A wrap up for the film. Although overly simple, even as a metaphor, it was a perfect way to demonstrate and cleanly tie up the concepts of the film. Brilliant really. Sometimes keeping things simple is the best way to go and Esper demonstrates this perfectly. Why make things so confusing you need a PhD to understand what's happening? "Imposter" reminds us that with some creative thinking, you can demonstrate highly complex issues in a way we all understand. Now if only a medical solution to this real life problem was as easily simplified. Watching "Imposter" glide from scene to scene was a treat of sorts. As a micro budget film, I tend to lower my expectation in advance simply because it lets me enjoy the title that much more. This title was different. I'm not going to go on record and write "Imposter" looked like a summer blockbuster, but it definitely looked pretty sweet. That's not all. "Imposter" is almost silent. The only dialog takes place at the start of the film, and you won't even notice the lack of words. This isn't a title that requires a lot of exposition. As stated above, things are kept simple to follow, and the lack of lines cements the need to actually direct the cast in a proper way. Esper took the challenge and made good. The actors don't need the lines to convey their thoughts, they do just fine with their body language alone. I suppose that had I wanted to keep things simple, I could have just wrote that I really liked this title. Production elements aside, it's not every day that I see an indie title where everything just seems to work. Making this kind of stuff work on a micro budget and within 10 minutes is always a treat to watch. I really don't know what else to write. This is one of those diamond in the rough independent films, that just knows where to hit and how to do it. How to keep things interesting. Check out the trailer below. What's stopping you? Is it that little voice in your head? If so, "Imposter" will show you how to deal with it. Once and for all.